A variation on a tune previously posted. I like the "compuvox" preset but it was so full-bodied it was masking things in the mix. This one has lighter leads and is a bit longer so I could hear some of the percussion stuff I liked. It's sort of stiff and halting by design. The arpeggios at the beginning are kind of an experiment. In a previous post I mentioned my and John Parker's Scratch Ambulance CD was being marketed through iTunes. This led to a friendly email wondering why I'd changed my mind about iTunes. I haven't! The company we used to press the CD also helps the artist market the work through a number of different indie and non-indie sources, one of which is iTunes. It's gonna be a couple of weeks before it's available. I still don't have iTunes on my computer and still dislike it. I just don't dislike it enough to prevent a few pennies possibly coming my way by withholding my music from it. I've never used a portable stereo type device (headphones hurt my ears) but I also like the idea of DRM-less sound files being freely distributable outside a monolithic single-company scheme. On my computer I have Winamp, which takes files from my own foldering system. 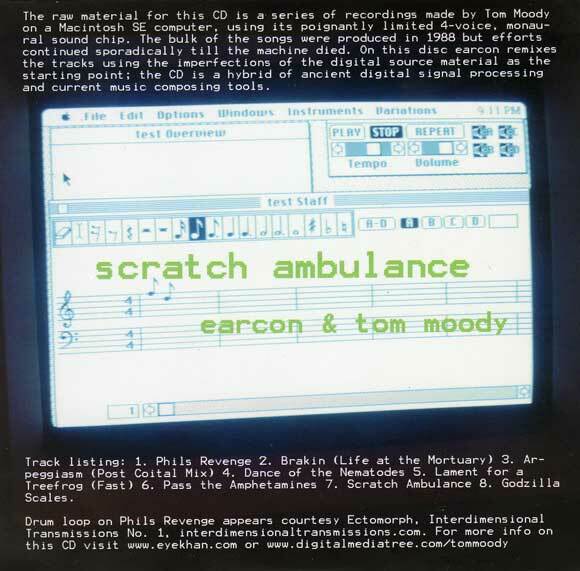 These are front and back scans of the CD cover for Scratch Ambulance, a music collaboration between John Parker (under his earcon alias) and me. 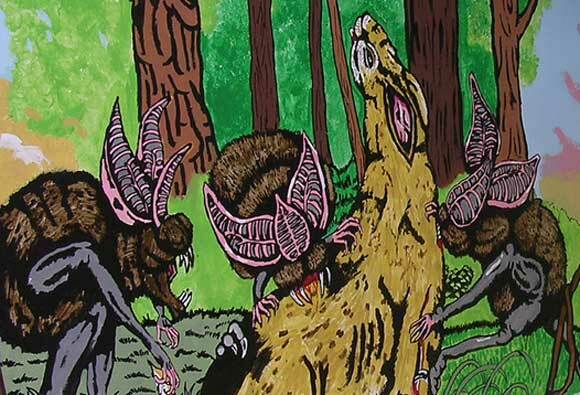 The release has been "pressed" and in the next few weeks will be offered on iTunes and wherever fine alterna-CDs are sold. I designed the cover and John mastered the tunes. I'm happy with how it turned out. 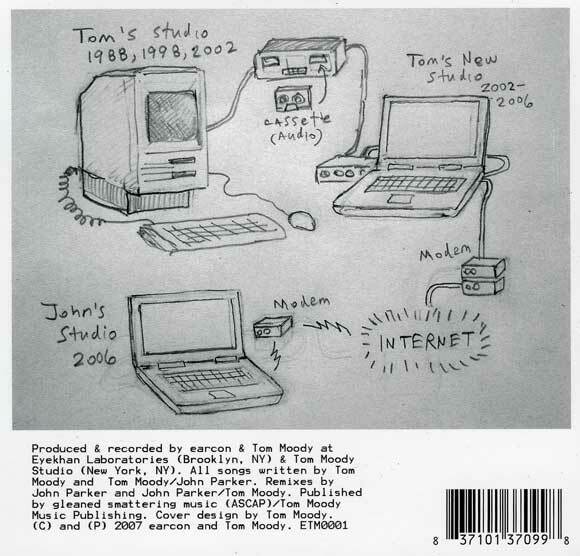 As the front cover explains, these are John's remixes of tunes I wrote on my old Mac SE from the late '80s until it died a few years ago. It is instrumental electro, a mix of old and new sounds, but more a present day artifact than a paean to the '80s. The idea was to preserve what was worth preserving from what we call "ancient digital signal processing" and composing software written circa 1984. The original music isn't archivally respected but rather sampled and used as mashup material, with many of the original melodies and harmonies still lingering. Also the files were passed back and forth on the Net so both of us are adding current material to the mixes. 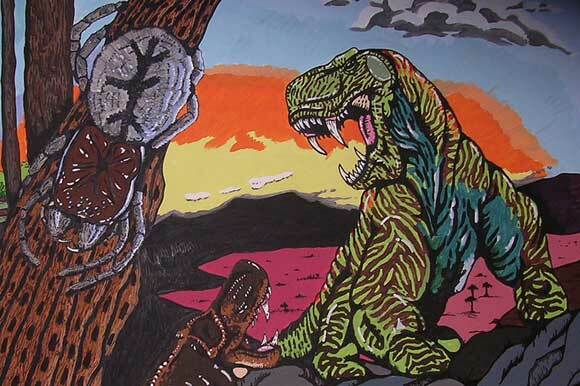 Thanks to Philip Shropshire for introducing me to this artist's blog. 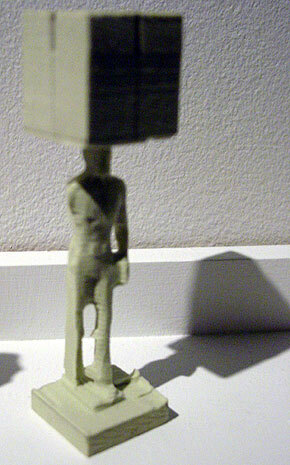 Figures by Mike Beradino at vertexList, Brooklyn, NY (show ended yesterday). An abject and rather intriguing response to Karin Sander and others working with rapid prototyping (3D printing) technology. These are made using some kind of (modified?) 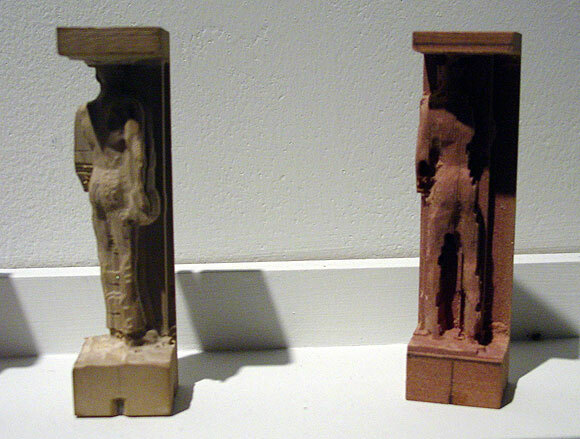 CNC milling, a reductive technique, but according to the gallery, extrusion (additive) techniques are also employed. 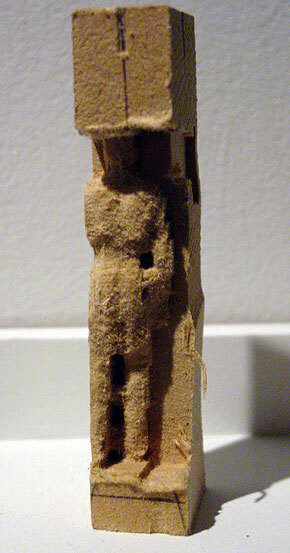 Beradino puts different materials (styrofoam, wood, etc.) into the mill for computer guided laser carving, and there is also hand carving on some of the figures, I'm told. 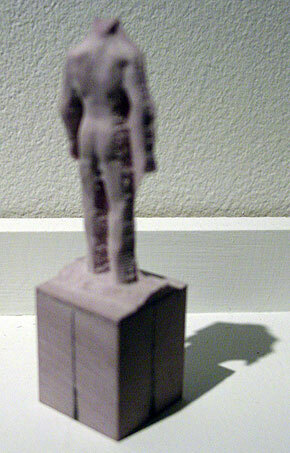 Instead of Sander's little everyman and everywoman miniatures, which relate to "life," Beradino's model is an avatar downloaded from the virtual world du jour Second Life--originally a smooth, Silver Surfer style humanoid--along with whatever artifacts and extraneous data come with the 3-D image file. 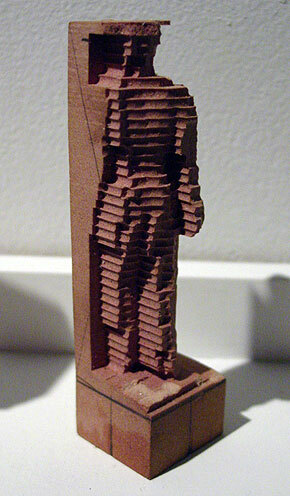 Hence the cubes and frames attached to the figure and imperfect or grotesque forms. Beradino's statement suggests he takes steps to exacerbate the digital noise (see below). Karin Sander's 1:10 is a series of three-dimensional figures that are essentially reproductions of people, fully dressed, rendered one-tenth life-size in plastic acrylic. 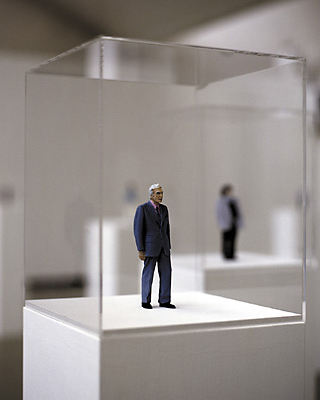 Each figure was created by a three-step process that begins with an elaborate, 360-degree computer-driven scanning apparatus that uses up to twenty cameras to produce a 3D data file describing in minute detail the appearance, posture, and clothes of the “sitter”. After seeing the scan represent-ed as a 3D “wire model” on a computer monitor, the sitter can have the technicians redo it. 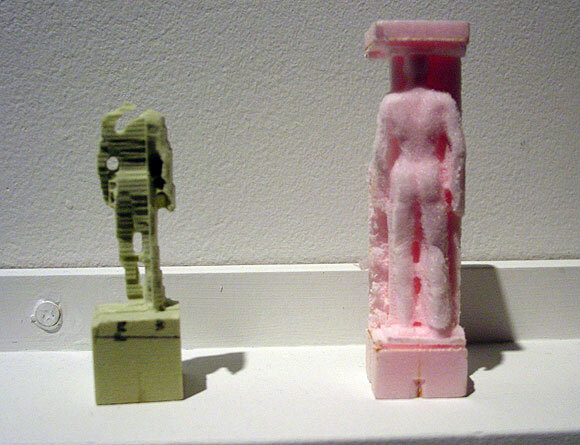 The final, sitter-approved data file is then sent to another company, which uses it to produce the actual 3D figure by feeding the data into a computer-driven extruder that sprays out thin layers of plastic acrylic, each representing a horizontal cross-section of the subject's body. When the figure is finished, it is sent to an airbrush technician, who colors it according to snapshots made by technicians at the time of the original scan. Curiously, at no point in this process is Sander herself physically present. Other than accepting or (very rarely) rejecting the final product, she chooses to make no decisions concerning how the sitters will be depicted. Some subjects arrive with suitcases of clothes at the company in Kaiserslautern, Germany, that does the original scans. 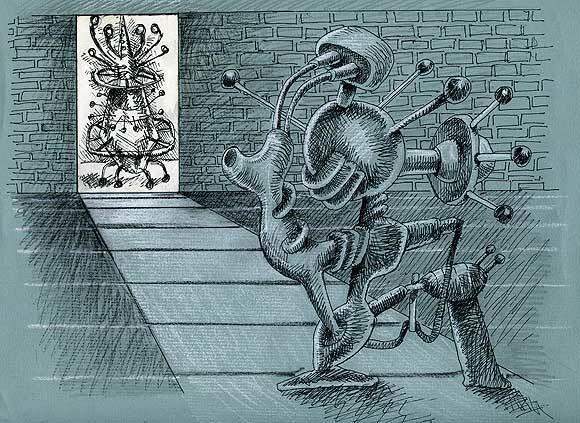 What they wear and how they are depicted is wholly their decision, not the artist's. Beradino seems more interested in how the tech breaks down: "My works are physical recursions, between the digital and physical. These recursions are similar to a feed back loop such as a microphone next to a speaker. The speaker output signal becomes the input of the microphone and so on and so on. An object is created then digitized then produced then digitized then produced." 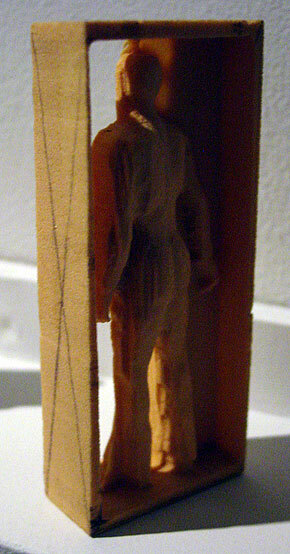 This introduction of random, subjective, "wild" variables into a process that's supposed to be about creating near-perfect copies is much appreciated by this viewer, as is the celebration of the do-it-yourself factor, in contrast to the oppressive '80s/early '90s art model of mediating between corporate teams as a form of social sculpture with a well crafted collectible bauble as a result. 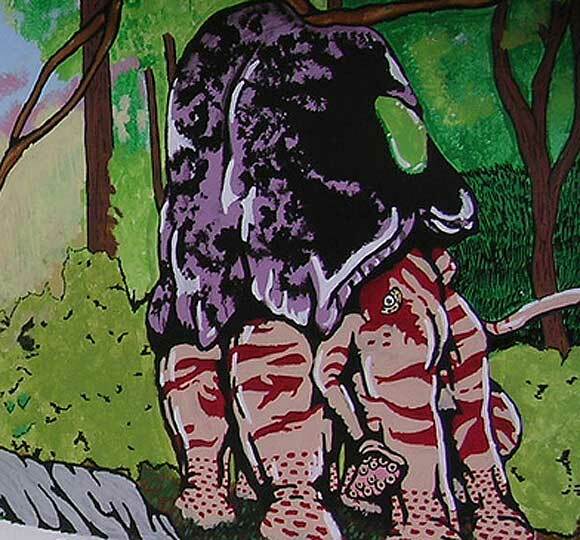 Sander's work was considered paradoxically human or humanistic for all its mediated facture. Beradino's figures also have a quality of melancholy or pathos but it is the pathos of the cyborg, and a failed one at that, a reading only implicit (or repressed) in the Sander, which for all its rigor involved a fair amount of tweaking by "professionals" to get "right." 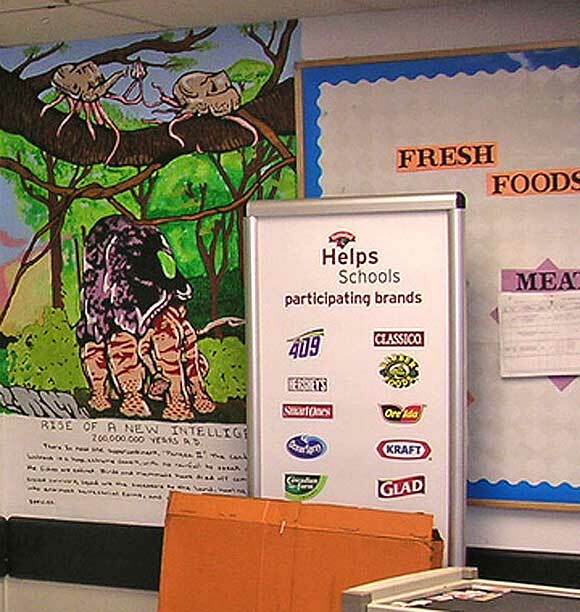 Details of photos from the blog Anaba a while back--the subject is an "outsider artist" mural done in the employee break room of a chain grocery store in upstate NY, depicting the history and future of life on Earth. (It took me two years to figure out how to enlarge and save flickr photos--duh.) My earlier post on this is here. Great use of color, as L.M. noted. Very anime-like. Regarding the third photo down, it's hard to imagine that an intelligence will rise 200,000,000 years hence to rival the one that put Kraft Crumbelievable and Ocean Spray high fructose in schools.